We spent over 45 hours researching and testing 20 different types of bird feeders and found that construction, design, and features were most important. The Nature’s anywhere window bird feeder scored high marks in every area and is our top pick. There are many reasons this bird feeder topped the list including the convenient sliding tray that made refilling super easy, the squirrel-proof design, drain holes to prevent the feeder from filling with water and the heavy duty suction cups that help it securely to the window. The sturdy acrylic construction allows bird watchers to view the birds unobstructed. Having bird feeders around your yard is a great way to attract a multitude of different local and migratory birds. Many people are avid bird watchers so giving them a source of food will give them a reason to not only come to your yard to eat but in many cases some birds will even build nests and continue to return to your yard for years to come. These top rated bird feeders are excellent for feeding the different birds in your area. All of them are constructed with quality materials and will last a long time with proper care. Finding the right bird feeders for your yard can feel like nothing but guess work if you don’t know what to look for. You will also need to know what goals you have when it comes to the type of birds you want to attract and what you are looking for in a bird feeder. The Window Bird Feeder House from Natures Anywhere offers one of the best experiences for bird watchers as you can watch from the comfort of your own home. The Window Bird Feeder House has multiple features that customer love including: a large sliding tray to refill the bird seed, a squirrel-proof design, heavy duty suction cups and drain holes to name a few. There are over 500 positive reviews on Amazon for the Window Bird Feeder House. It’s made from a high quality acrylic that is 5/32′ thick. The robust design of this bird feeder combined with the features that customers appreciate makes this our top pick. Natures Anywhere also offers excellent customer service and a money back guarantee. The Brome Squirrel Buster Plus Wild Bird Feeder has a cardinal ring that has been specifically designed to attract cardinals; a favorite breed of bird among many bird watchers. They are happiest on a thicker perch that has texture to it due to their anatomy which is big feet and a small neck. They want to face the food directly and this cardinal ring gives them that opportunity all the way around the bird feeder. One of the features that consumers love about this bird feeder is the fact that they are squirrel proof. Squirrels are cure and furry little creatures but they can wreck havoc on a bird feeder, oftentimes chewing through the cheaper plastic ones, to draining the bird feeder dry of seeds. The seed capacity of this bird feeder is 3 quarts and the feeder itself is very easy to assemble. Cleaning should be done periodically as well. The seed ports on the feeder will close automatically wherever a squirrel climbs onto the feeder like they often do. This prevents them from being able to drain the feeder of all its seeds, leaving nothing for the birds. The seed ports will close even if a large bird tries to get on it and eat everything. The closing mechanism is adjustable so you decide what weight closes access to the seeds. This adjustable weight settings gives you control over what birds are able to access the bird feeder and which cannot. You may see such birds as gold finches, chickadees, cardinals, downy woodpeckers, indigo buntings, and more. It is easy to fill, and you can hang it anywhere you want. It hangs with a wall bracket, tree hook or extension hook which you can purchase separately. Cleaning the bird feeder is also easy, as it is dishwasher safe. Measurements of the Squirrel Buster Plus Bird Feeder by Bromeare6″ x 6″ x 23″. Customers who purchase this excellent and quality made bird feeder receive a lifetime, hassle free warranty as well. This beautiful copper bird feeder looks great and provides the birds in your yard with a comfortable place to come eat too. 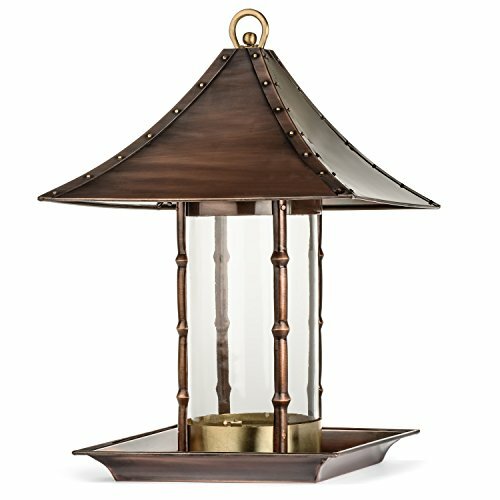 The all metal, antique copper finish bird feeder is durable and long lasting and adds style and class to your bird watching endeavors. The seed container is made of glass which is much more durable than plastic and the solid brass trim accents the feeder attractively without being so fancy the birds don’t want to eat from it. Refilling the bird feeder doesn’t get much easier; just remove the roof and fill it up. The H Potter Top Fill Bird Feeder measures 9″ x 14″ and has a hanger to hang it from. 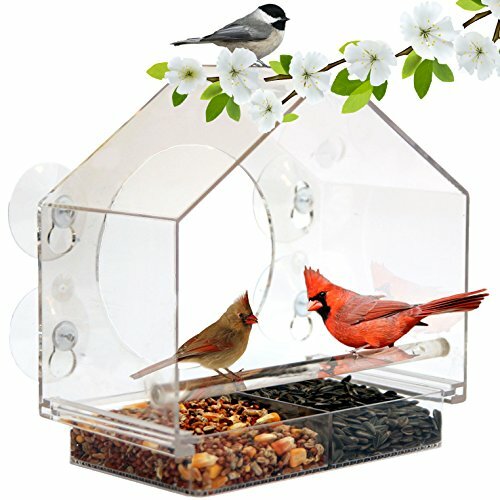 It’s the perfect gift for anyone who loves to bird watch and who wants to provide the birds with a place to eat that is stylish and unique. This is not your every day bird feeder, that’s for certain. Many people love to make their yard a sanctuary and having a bird feeder as decorative as this one can add to the beauty of your yard while offering food and relaxation to your bird guests. This is not just your every day bird feeder; it’s one that is durable, made from long lasting, good quality materials and has a lot of style. 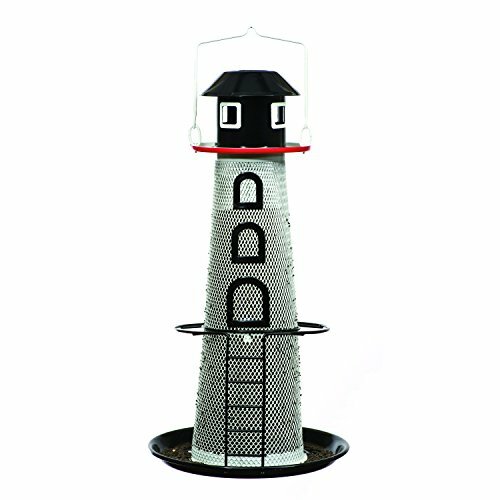 If you love nautical décor, this lighthouse shaped solar bird feeder will make your day. This finch feeder from No/No is sturdily constructed from metal and metal mesh that have been powder coated. You will have a full 1 ½ pounds of seed capacity in this unique and attractive bird feeder. The design of this lighthouse prevents any water from gathering inside the feeder and messing up the seeds inside. The sides offer plenty of space for the birds to perch and cling to get their food. It can hold up to 15 birds at once! The classic black and white color scheme has a splash of red in traditional lighthouse flair. A little ladder connects the mid-feeder ring to the feeding tray offering birds a second level to eat their seeds and rest. The solar powered LED casts a nighttime glow from the four tiny windows at the top of the 14″ lighthouse making it possible to enjoy looking at this bird feeder any time, day or night. The squirrel resistant designed lighthouse bird feeder is easy to clean, fill and maintain and will last for a long time with proper care. It is a perfect gift for the ocean lover that also loves bird watching. No assembly is required; just open the box, take it out, fill it and hang it up for the birds to enjoy right away. All three of these bird feeders can make a great place for wild birds to feed and rest. These top rated feeders are unique in design. Sturdy in construction and hold plenty of seeds for your bird guests. Each one is different and many bird enthusiasts enjoy all three designs to give their wild bird friends plenty of places to perch and eat. Quality construction is important for bird feeders due to squirrels that will almost always go after the seeds in the feeder. Purchase a cheap, plastic style feeder and a squirrel will not only eat all the birds’ seed they will most likely destroy the bird feeder in the process. All metal construction ensures durability and provides long lasting enjoyment for any bird watching enthusiast. Once the birds in your area get wind of the seed and feeders you have up, you will notice that they return again and again to your feeders, even after they’ve migrated away for the winter. Come springtime you will see them again. Many people are interested in watching birds and providing them a place to perch and rest while eating to their hearts’ content. Bird watchers love seeing different and numerous birds hanging out in their yard all throughout the year regardless of the season. Below is a guide that will help you compare and weight the different aspects in different bird feeders and decide which one is the best choice for your yard. Less insects in your yard – Because many birds eat insects including pests like gnats and mosquitoes, you will notice there are fewer insects around the outside of your home when you have frequent bird visitors. Flower pollination – Many birds love to sip the nectar of the flowers in the yard which helps with pollination. Weed control – Birds such as finches, sparrows and others will consume a lot of weed seeds which will help control the weed population of your yard. Relaxation – Bird watching is a calming activity that can help de-stress overworked or stressed individuals. Spend an hour or two just watching the birds that come into the yard and you may notice that you are a lot calmer. There are many types of bird feeders on the market. The kind of birds that you attract into your yard will depend on the types of bird feeders that you choose. Below we have listed the different types of feeders and the birds that are typically drawn by those types. Hanging Bird Feeders – Hanging bird feeders can be cylindrical in shape with openings for the seed and several perch options including stick perches and ring perches. The birds that they typically attract include Goldfinch, Tree Swallows and Bluebirds. House Feeders – These bird feeders are identified by the house shape they have. They may be made of metal, plastic or wood. Many bird watchers love the house style bird feeder. There are a multitude of things you could choose that have the house shape. Species of birds that are usually drawn to the house hopper feeders include the very popular Cardinal, Purple Martins and Grosbeak. Suet Bird Feeders – Suet bird feeders are usually wire or some are bags with perches that the suet goes into. Species that are drawn to suet bird feeders include Nuthatches, Woodpeckers, Tufted Titmouse, Warblers, and Baltimore Orioles. Hummingbird Feeders – Humming bird feeders can come in a variety of shapes and sizes. They are designed to hold commercial hummingbird nectar or you can make a mixture of sugar water which hummingbirds also enjoy. Hummingbirds are the only bird species that is drawn to these feeders although you will see bees frequently feeding on the nectar. Make sure that you know the species of birds that normally populate your area so you know what type of bird feeder will reap the biggest results. This will prevent you from wasting effort on using a certain type of bird feeder only to find out the species that are attracted to that style of feeder are not common to your area. There are many different places that you can choose to hang a bird feeder. Most avid bird watchers put many different types of bird feeds around their yard to they attract as many species as you can that are in your region. In front of a window – This is a terrific location to hang a bird feeder. It will provide you with ample opportunity to see many different species while you are either washing dishes, cooking or just sitting and relaxing. Make sure you place the feeder in the right place if you choose to put it in front of a window. Put them either less than three feet away from the window or farther than 10 feet away to avoid and reduce the incidences of window collision. From a Tree Branch – Hanging your bird feeder in a tree attracts many different species of birds. It also will attract squirrels that will use the tree and its branches to get to the feeder. If the bird feeder has wire mesh and cages, it can eliminate the success of the squirrel obtaining any bird food. Free standing near a bird bath – If you place your bird feeder on a hanging post near a pond or birdbath you will attract many different species of birds that love being around water. To avoid the squirrels from ruining the feeder, choose a variety that is a success currently, and I will show you how to achieve them. On the Porch or Deck – Hanging a feeder here will not result in a ton of birds simply because the close proximity to the house and humans can scare them away. If you leave the feeder there and make sure that you keep it full of fresh seeds, eventually they will get used to the close proximity and be just fine but it will take some time for the birds to establish trust and become comfortable. In your flower beds – If you put some free standing bird feeders in your flower beds, the different seeds that the flowers have will draw many different birds to them. Many different types of feeders will work well in your flower beds and that will bring you a variety of species. If you use ground feeders you will see sparrows, juncos and mourning doves as that type of feeder attracts those species. Bird feeders are made with a variety of materials such as metal, wood and plastic. Each of the materials has different properties that make them what they are. Wood – Any wood bird feeders that you purchase needs to be made wood that has been treated to become water resistant. This will ensure that the feeders do not rot. Cedar is a popular choice among bird feeder manufacturers and provides a wonderful smell for the birds as well. Plastic – This is the most inexpensive material to use and results in a very inexpensive bird feeder that is functional, but not always very attractive. Another issue with plastic bird feeders is that they can be damaged extensively by squirrels that won’t hesitate to chew right through a plastic bird feeder to get to the seeds inside. Metal – This is the favorite in terms of producing a bird feeder that is strong, durable, has a lot of variety when it comes to design and that will stand the test of time. Metal bird feeders are almost always squirrel proof and can last years, as good as new. Bird feeders are popular items to purchase by bird watchers so they can enjoy watching them eat, interact with each other and relax. There are dozens of styles, shapes and sizes of bird feeders on the market today. Choosing one can be a challenge if you do not know what to look for. The most important factor there is when it comes to choosing a bird feeder is knowing what birds are normally in your area. Purchasing the right bird feeder becomes much easier when you know what birds you have in your area. Then you can get one or more styles to attract many different species to your yard and enjoy their day to day interaction. The purpose of these reviews and this buyer’s guide is to make sure that you have the knowledge needed to choose the right feeder for your region and yard. When you know what to look for and what you prefer, choosing the right one for your needs becomes easy.